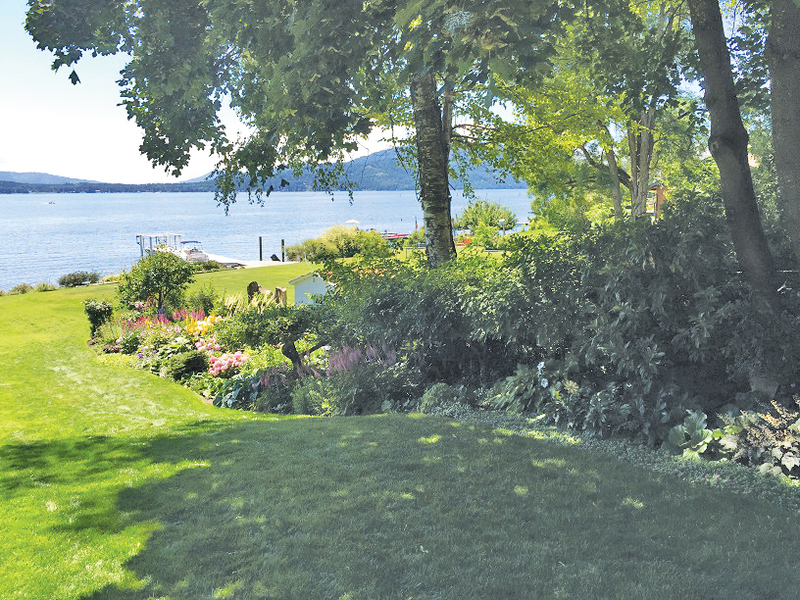 Get ready for another festive and fun BCGA Garden Tour! Sunday, July 15, from 10 a.m.-5 p.m., is your opportunity to see six outstanding local gardens. Get a carload of friends together and visit these lovely works of natural art. Take your time and enjoy the ambiance of each unique landscape; there are details to delight and enchant anyone. One of the stops on last year’s tour. Courtesy photo. The Healing Garden 520 North Third Ave., Sandpoint. Created by the community and maintained with loving care by volunteers, the garden is adjacent to the hospital. Wandering through the lush plantings, intricate rock work and whimsical art will raise the spirits and bring smiles to all who enter. A small chapel and a gazebo overlooking Sand Creek provide places for quiet contemplation. Vining plants, roses and shady grottos complete the peaceful effect. Rimar’s Retreat Bonnie Rimar’s garden. 730 Whiskey Jack Circle, Sandpoint. A lovely landscape that beckons one with a sense of calm and relaxation. A dry stream bed, a soothing lawn and trees in the front of the house and a large patio area in the back say “Stay awhile and relax.” Enjoy the flower beds and vining plants, which frame a view of lake and mountains. Look for interesting garden art among the plantings. The Serenity Forest Garden by Bob Baker. 624 Whiskey Jack Road, Sandpoint. An attractive curved brick wall and verdant rhododendrons form a dramatic entry to this well tended “bachelor garden.” A “contemplation hut” surrounded by plantings provides a point of interest. Follow the wooden walkway to the backyard, where a terraced slope adorned with apple trees and mugo pines leads the eye to the water’s edge. Whimsical art pieces provide pleasant surprises throughout, and inviting deck areas are great for wildlife viewing along the slough. A Casual Country Garden Joyce Spiller, owner. 10624 W. Pine St., Sandpoint. A circular drive presents a view of the front of this comfortable home, with large rock features and ornamental plantings. Enter the private area of the landscape through a gate to find a charming fairy garden and ferny grotto. A small pond exudes a cool feeling, and a child’s playhouse speaks of laughter and fun times. A second gate leads one down an aspen lane to a peaceful memorial garden and pond with a gazebo where one can rest and take in the surroundings. New Beginnings by Ann Keiser, 122 Woodview Road, Sandpoint. Tall conifers greet the person entering this beautiful place. The stately trees frame a shaded retreat, framed by lawn areas and native rock accents surrounding colorful flower beds. Raspberries grow abundantly on one side of the house, with shrubs and perennial flowers brightening the yard. A new large vegetable garden and orchard area promise to provide healthful food and a future of plenty of produce to preserve or share. Serenity Place Alex Gray’s garden. 145 Serenity Place, Sandpoint. Nestled in a forest environment of tall trees and shady glens, this garden has an abundance of shrubs and perennials in many textures and colors. Sun-loving plants peek out from under trees, and surprisingly, a couple of cacti have found homes in the landscape. Rocks are featured, from natural outcroppings to imported boulders and dry stream beds with round stones in pale colors that meander throughout the property. A flagstone fireplace adorns the back patio, and a tree house and bike course provide entertainment for the family. Tickets for the Garden tour are $15. You may purchase a ticket at the first garden you visit, or obtain them online in advance at www.bcgardeners.org. Get ready for a fun day full of ideas to take home and lovely landscapes to admire.